This has been growing for a while. 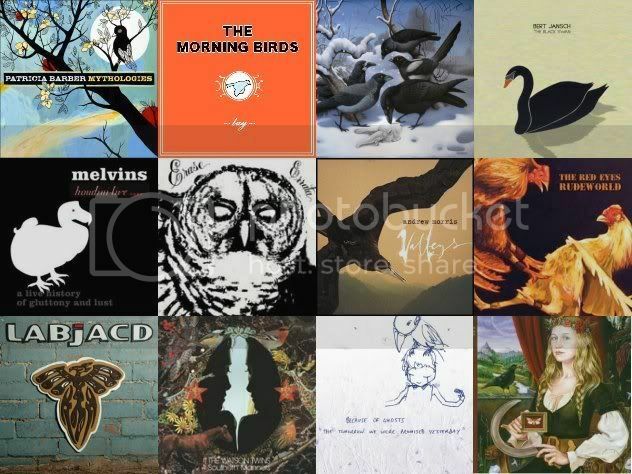 I decided to split the usual roundup of current/recent album covers using animals as iconic images, by putting birds into their own category. Actually, there turned out to be so many that they're not all here, so at least one might appear in the next lot. It's been a good year for birds in music, kicking off with Kate Bush's Aerial, featuring a clever soundscape as landscape cover, built out of a blackbird's song. My usual principle for selecting these images is that the animal/bird has to be the featured icon, not just a minor accessory to a picture of the artist. I decided to relax that a bit this time, so the last three do include people (one even the artist herself).